The rustling of the leaves broke the silence as we sat on top of a giant boulder less than a mile up the trail. The rock appeared as if it had been gently placed in that spot, in between the creek and a field of straw-like grass. It was October and it was getting colder as the sun set. My sister was awfully quiet and I could see the tears welling up in her eyes as my mom and I talked about life before the divorce. My parents separated in 2010 when I was a junior in high school. My sister was just 9 years old then, and it is not a subject she likes to discuss. But at the canyon, such conversations happen. The place is a reminder of my parents as a couple, of the time all four of us spent together as a family. We first went to Madera Canyon in 2004. We had recently left Miami, Florida, and moved to a small town in southern Arizona after my dad accepted a position with the Border Patrol. I’d never before seen mountains or lived in such a dry climate. I’m not sure how we discovered Madera Canyon; I think my dad might have been working in the area. But we kept coming back. It was there that I first saw snow. It was the first place I went camping. It was where we’d take family and friends who were visiting from out of town. Madera Canyon is about 20 miles south of Sahuarita, Arizona, the town in which we live. It takes about 20 minutes to drive to the base of the mountain and another 15 minutes to drive up the narrow winding road that leads to the trails. Picnic areas and wooden cabins, which can be rented for a weekend getaway, lie on each side of the two-lane road and it’s not uncommon to see white-tailed deer crossing the road or grazing nearby. The canyon is located inside Coronado National Forest, in the Santa Rita Mountains. The highest point on the mountain, as well as the tallest peak in Tucson, is Mount Wrightson, with an elevation of 9,453 feet. The Santa Ritas are one of the largest of what are called the Madrean Sky Islands—isolated mountain ranges where desert and forest meet, often with cacti in the lower canyon and aspen and pine at the summit. In Madera Canyon, the temperature is usually about 10 degrees cooler than in the city, a nice getaway from the summer heat. Madera Canyon also has a seasonal creek, fed by melting snow and summer rains. In 2005, a lightning-caused fire burned more than 11,000 acres, destroyed the Florida Canyon watershed, and threatened a nearby observatory. We could see it burning from our backyard. 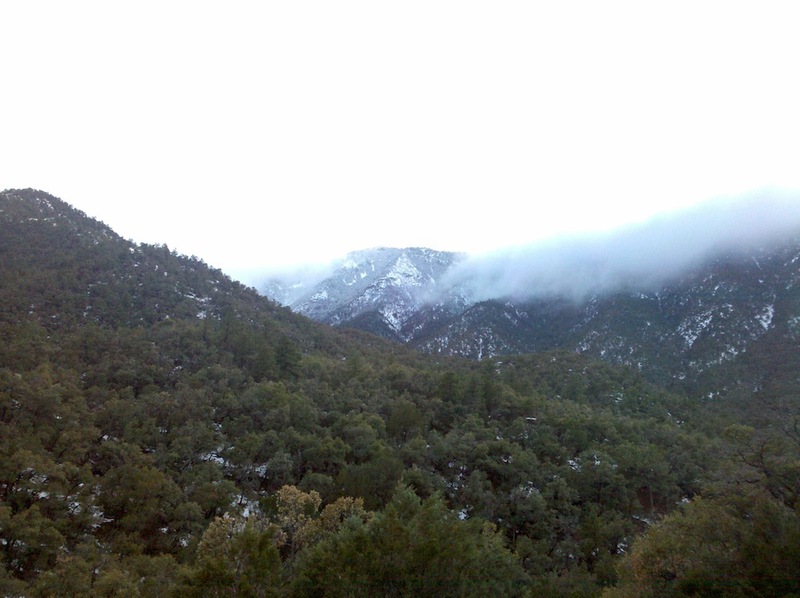 January 23, 2010, was the last time the four of us went to Madera Canyon together. There’s a photo album on my computer with pictures from that day. The album cover is a picture of my dad holding a miniature snowman he’d helped my sister make. It had just snowed and I remember being really cold, even under all the layers I was wearing. My mom was shamelessly carrying around a giant blanket while the rest of us suffered. The pictures show four happy and loving people—except for the one where my sister is crying. I think she was cold. 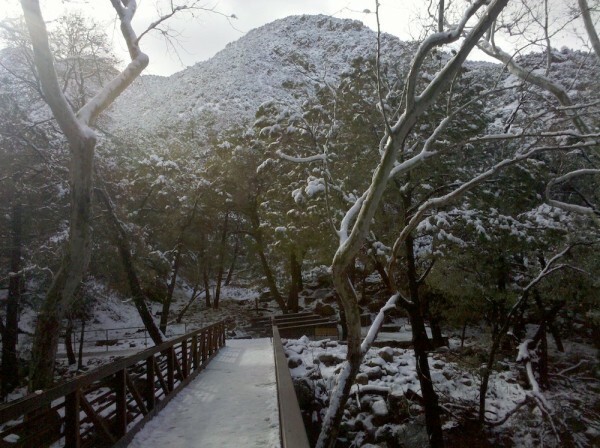 Madera Canyon was a popular destination on that day—as it is on many days, especially on holidays and after it snows. But even with so many people around us, the canyon always felt like a sanctuary, a place where we could appreciate our new home and new experiences. It’s funny to think that two months later my parents separated, because in that moment everything seemed fine. Maybe everything was fine. So much has changed since we first went in 2004. Not just my parents’ divorce. My mom has beaten breast cancer, my sister is a rising high school freshman, and I just graduated from college. The one unperturbed constant throughout has been the canyon. I’ve gone back several times after the divorce, mostly with my dad and sister. My mom and I always plan to drive out there when I’m home for the weekend or on break, but we rarely follow through. That last trip in October was like a flashback of the 10 years we’ve lived in Arizona. It was a reminder of our ups and downs, which always leads one of us to question how life might have been different if we would’ve stayed in Florida. I’d forgotten to bring a sweater and the wind was picking up as night approached, but I didn’t want to leave. Paulina Pineda just graduated from Arizona State University.